Safety first.Above all, wherever you store your cleaning supplies should be well out of reach of small children and pets. If you don’t have a high shelf or lockable closet, use safety devices, such as drawer and cabinet straps, to ensure that little fingers or curious paws can’t get to hazardous materials. Pick one spot for cleaning gear storage.That way, you won’t have to go from room to room tracking down toilet cleanser or wood soap. Also, don’t stack bottles and cans so deep that you’ll have to burrow through them to find the particular solution you’re looking for. Keep a portable caddy or two next to the supplies.Fill it with what you need to clean a given space. In addition to cleaning solutions, include a stock of rags, sponges, scrub brushes and more. 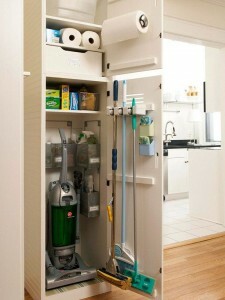 Alternatively, you can make a caddy for each area of the home (kitchen, bathroom, etc.) and grab it as needed. Designate a place for larger cleaning tools.Vacuum cleaners, steam mops and other big items can go in a spare closet, the pantry, the garage or the basement. The exact spot is less important than keeping them all together so you can put your hands on them whenever you need them. Make sure everything is clearly labeled.Keeping solutions in their original containers is always ideal, but if you decant them into all-purpose spray bottles or jugs, use a permanent marker or labeling tape to identify them. For example, you don’t want bleach getting confused with plain water! Need help finding cleaning supplies? Easy, head over to PlumbTile, where our expert employees will be able to point you to all of our favorite cleaning supplies that will leave your home feeling squeaky clean. They will be able to answer any and all questions that you may have about the cleaning supplies. Besides… what’s better than a clean home?